Cut vegetable marrows across (into pieces the length of each is no more than 5 cm). Cut off the seeds and pulp. Boil marrows in salty water. Mince meat and salt it. Boil rice. Peel, cut and fry onion. Mix all ingredients. Stuff vegetable marrows with this mass. Put them in a deep stewing pan. Powder with breadcrumbs, sprinkle with melted dairy butter and bake. Fry wheat flour slightly. Dissolve it with broth. Add sour cream, slightly fried tomato sauce, and salt. Mix and bring to boil. 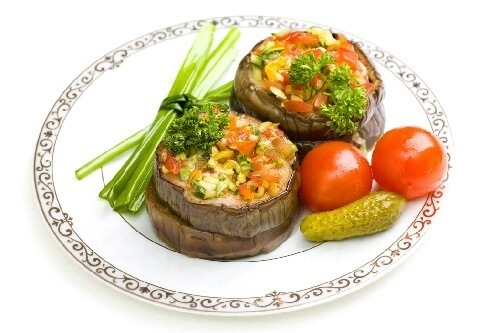 Pour stuffed vegetable marrows with sauce before serving.